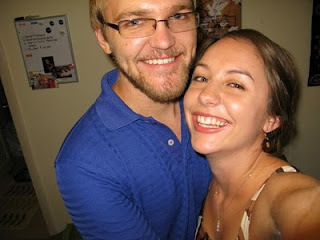 In honor of Valentine's Day, I thought I would post our engagement story (told by Eric). Valentine's Day will mark 6 months until we get married! :) Also, congratulations to Jenna and Owen on their engagement yesterday! I had known for a long time that I wanted to propose to Christa, but I knew I had to wait until the right time. I started my internship with Harley-Davidson in January of '09, so I was finally able to save up to buy a set of rings. I ended up buying them around Easter time and showed them to some family and friends, but it would be a while before I would be able to give them to Christa. After I bought the rings, I knew I wanted to wait a few weeks before I proposed, so I could get a plan together. First things first though, I needed to speak to Christa's dad. We stayed with him in his hotel room in Orlando one night (he was there on business). While Christa was taking a shower, I showed him a picture of the rings and asked if I could ask her to marry me. Things went great and I got the ok.
Next I had to get the rings sized to fit her 3 3/4" finger. I took the rings to some jewelers in the mall and no one would touch them, because they had to be cut down almost three sizes and the diamonds would each have to be reset. I told Christa's dad that it may be longer than I expected before I proposed because I thought I was going to have to sell the rings and buy new ones, but he asked around and found a jeweler for me that would rebuild the rings, and they did a great job. I wanted to get a portrait made of her with the ring painted on her finger. I tried having friends work on something for us, but couldn't get anything to work out quite right, so I ended up having a portrait made of the two of us (seen above) with the ring on her hand from a website. First I sent them a picture of us from a recent trip to Minnesota, along with pictures of the ring and a background picture which was taken from Cedar Key (where we went on a date). The portrait took longer than expected to come in, but it looked great. After all this, I was finally ready to propose. The summer was coming to an end, and I could hardly wait to see the ring on Christa's finger. 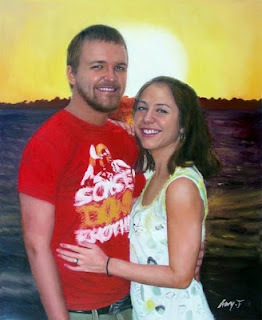 The portrait came in on a Monday, so I called Christa and asked if she would like to go out to dinner the next night. After Tuesday afternoon creeped by I picked up some flowers on my way to Christa's apartment to pick her up. I kept the portrait in the car and gave her the flowers when I came to the door. Once she was ready to go I told her to wait while I grabbed something from my car. I put the ring in my pocket, which was in a case shaped like a rose that my grandpa proposed to my grandma with, and brought in the painting. I could tell that she noticed the ring on her finger, but she didn't say anything for a few minutes. Finally she said, "There's a ring on her finger," so I asked her if she looked in her flowers. As she was looking in her flowers for a ring, I got on one knee and told her she was looking in the wrong flower. 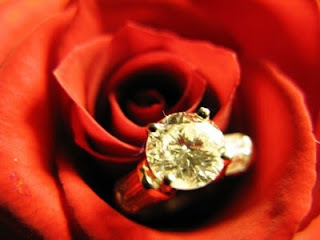 As she turned around, I opened the flower-shaped case and asked her if she would marry me. Thankfully, she said yes and we ate our celebration dinner at the Melting Pot.